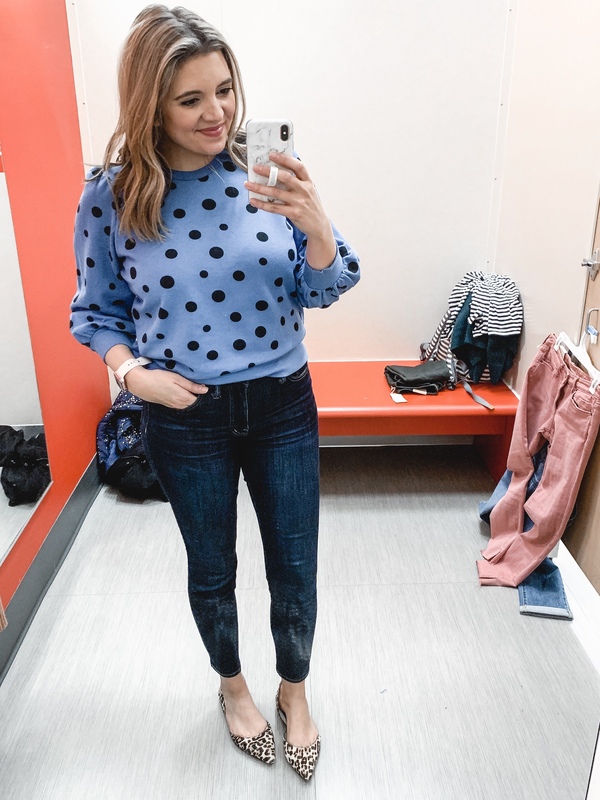 My February Target try on really epitomizes my relationship with Target. I walked in intending on finding three to five items to try for a mini try for y’all. 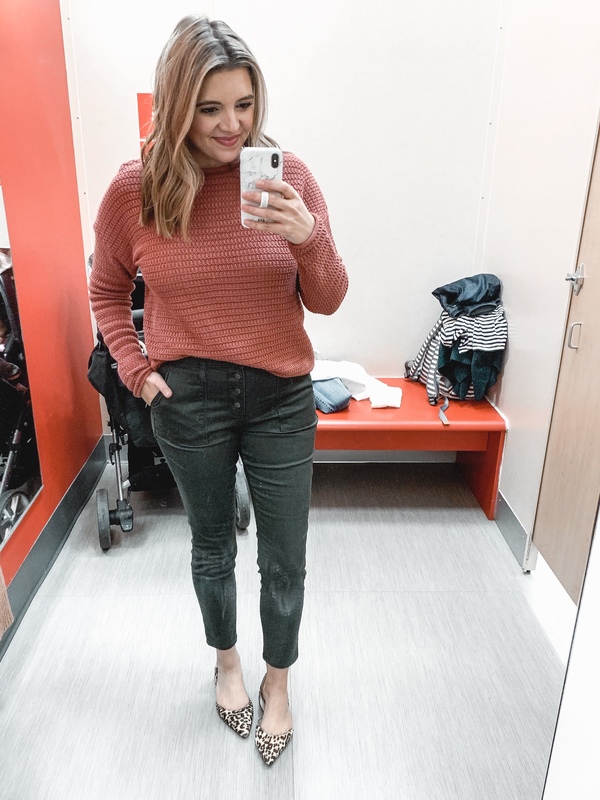 Twenty minutes later, I found myself in the Target dressing room with over ten items wondering how I got there. I know y’all can relate, right?! Target has some mystical power of making me black out and forcing all of the things to end up in my cart. But the good news is that good ole Targ has a bunch of cute new items to take your wardrobe from winter into spring! 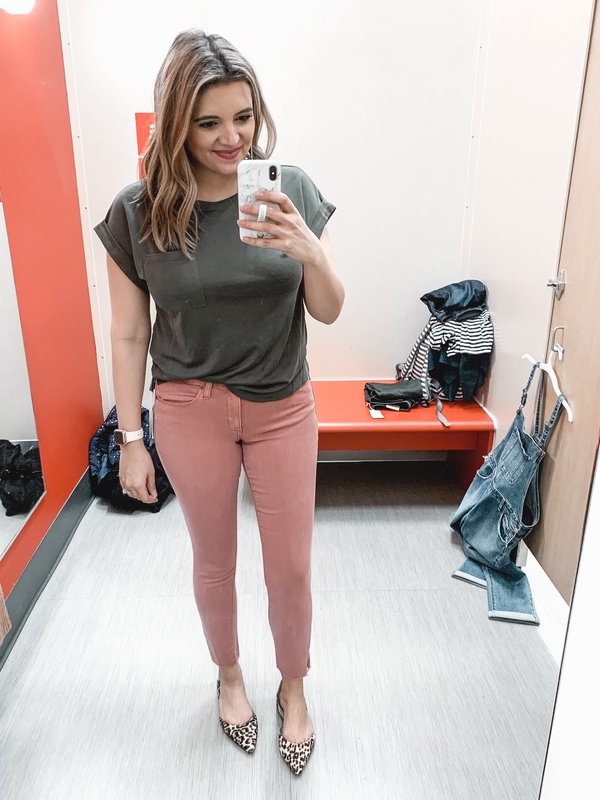 I was digging all of the pink and actually had to stop myself from trying on all the items in pink only. (Hmmm… so maybe I can have self-restraint in that store?!) 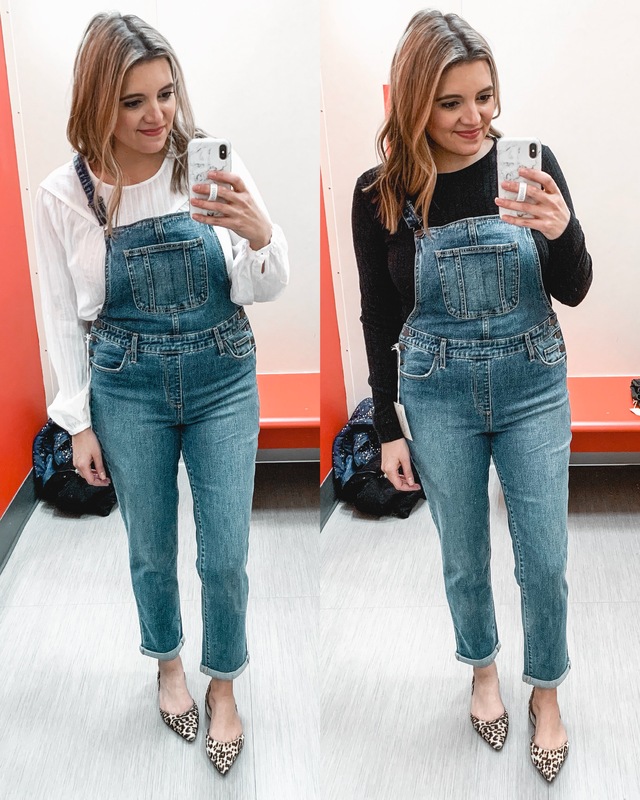 From denim to spring tops and even a pair of overalls, we’re covering all the latest in today’s Target try on! 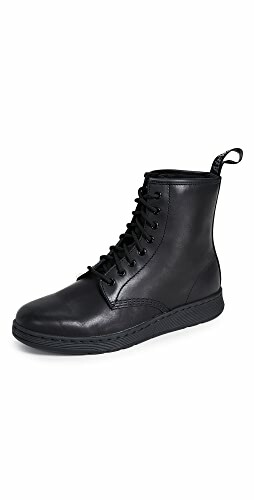 As far as sizing goes, I’m 5’7.5″, and an 8/29/M. I will list the size I’m wearing beneath each photo along with any sizing recommendations I may have! Let’s go! 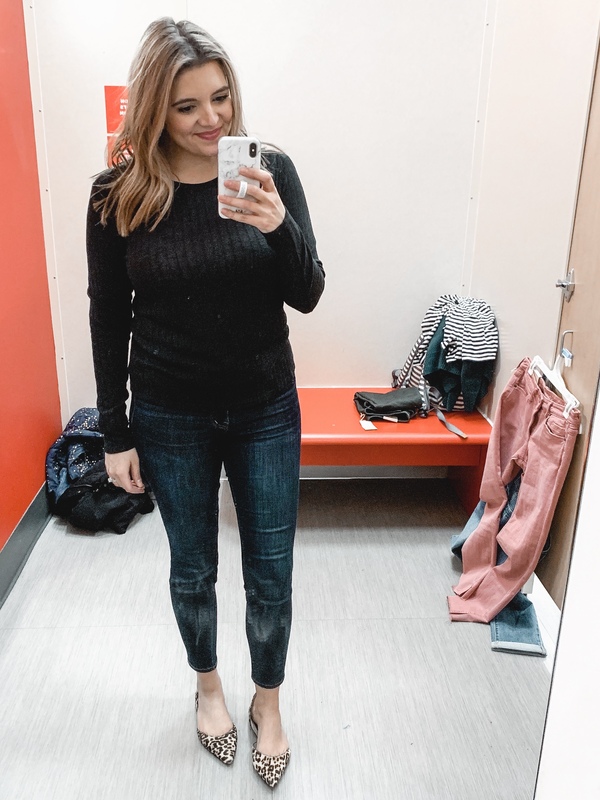 This sweater was the first thing I tried on, and it was one of my favorites of the entire try-on. It’s a lighter weight sweater, and the texture is gorgeous. This is the kind of sweater you can wear now all the way through summer! Just picture it with a pair of denim shorts! Fit is relaxed, but I’d recommend staying with your true size. I liked the medium on me! It also comes in three other colors! As for the jeans, I loved the style. 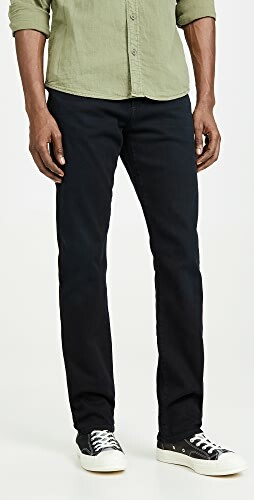 They feel more like a chino-like material to me rather than true denim. They have utility-style pockets and plenty of stretch. My store only had about three pairs of these left, so I tried on the 10. They were a little too big, so I think I would have preferred my true size (8). Just one other sizing note– the waist is a little more stiff than the leg in terms of stretchiness! 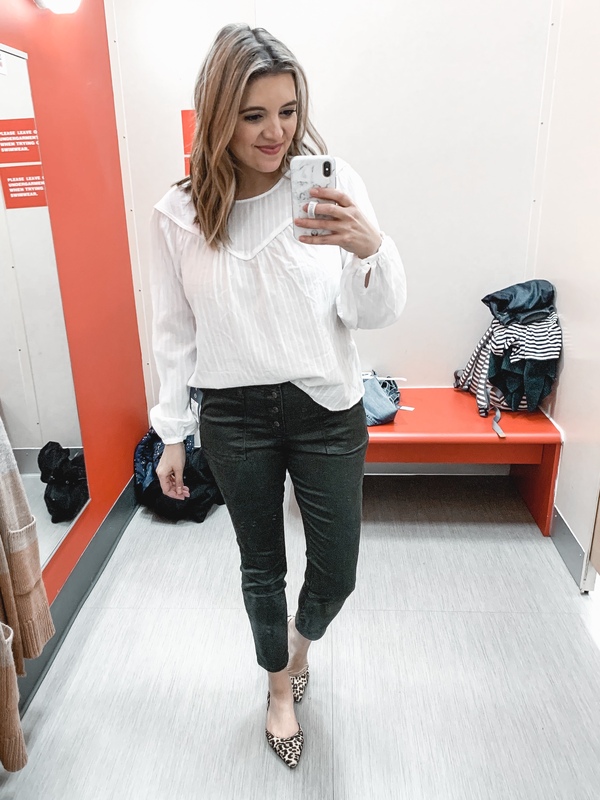 I think I’ve tried this top on in Target before, but I definitely have a type. 😂I love a gauze-y feminine shirt like this! The weight is very light and best suited for warmer weather, although you could layer it under a cardigan or jacket for now! 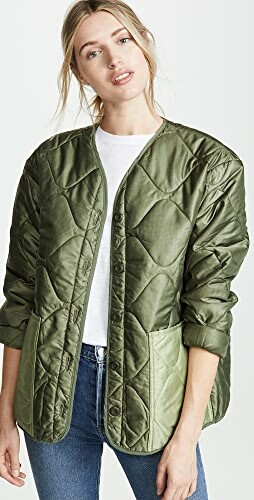 (It’d be adorable with a utility jacket!) Fit is oversized. You could definitely size down one if you prefer less of a blouse-y fit. I was pumped to see overalls in my Target! But, the moment I put them on, I immediately felt underwhelmed. First of all, they run big. I grabbed my usual size 8, but the fit across the hips was super-loose, which was not very flattering. To make these work, I probably would have sized down 1-2, although I’m leaning towards 2. I wish I had had more time to go find them in a smaller size for y’all, but I’ll try to do that during my next trip! I’ve been eyeing this tee for weeks now every time I stroll by the clothes! 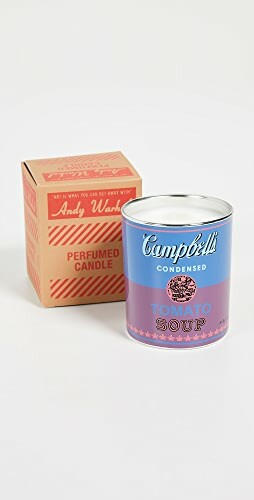 It comes in several other colors as well. I really loved how it looked on the hanger with the rolled sleeve, but I don’t love it on me. Where the sleeve hits is kind of a weird spot, making them stick out like little wings rather than laying more flat. I did like the cut and fit though! It’s relaxed with scoop hem. I’m in a medium. Pink jeans, y’all! I loved the color of these. They’re not too girly and more of a dusty peach shade. The cut is mid-rise with raw hem bottoms and a little notch at the bottom seam. As far as sizing goes, they’re pretty stretchy. I’m wearing the 28/6. They were a bit snug but felt like they’d be the type to stretch with wear. I recommend sizing down one. 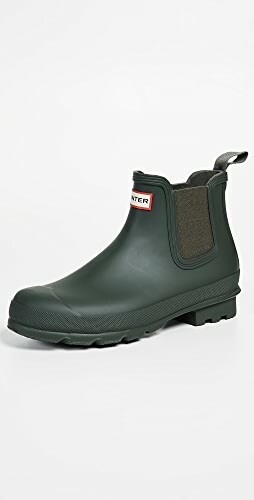 Another great into-spring option! 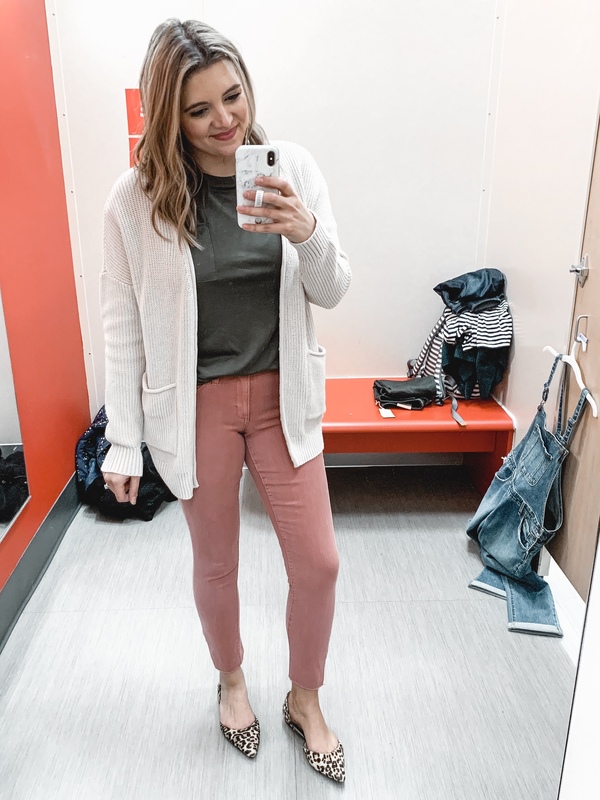 This cardigan has a nice weight and comes in several other colors, including that peachy-pink color of these jeans! It has a drop sleeve and fits oversized. I’m in a small and suggest sizing down one! 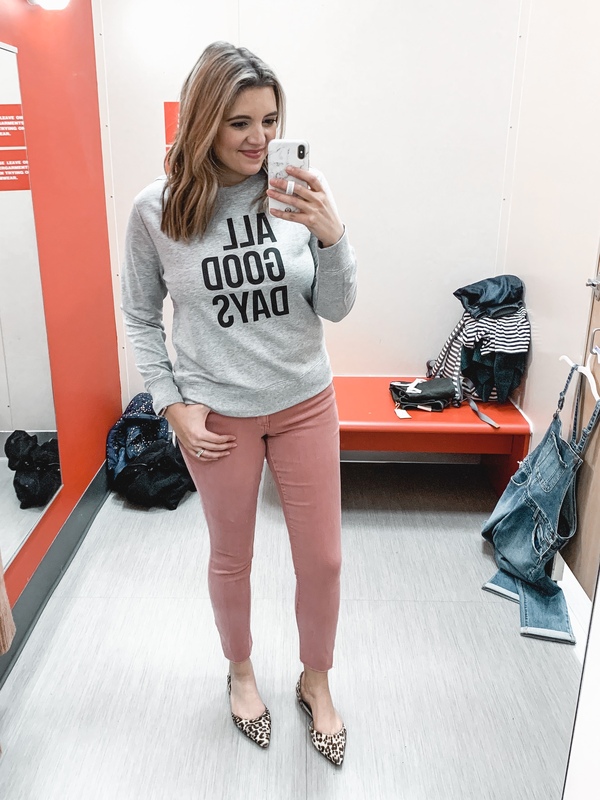 I’m a sweatshirt connoisseur these days, so I had to try this one! 😉It is so soft and comfy! The weight is a little lighter than your typical sweatshirt. It’s perfect for wearing out or tucking into jeans or a skirt! Fit is TTS. If you follow me on Insta, then you know that this came home with me. I put it on and instantly fell in love! It’s fun, girly and playful–perfect for spring! Fit is more of a shrunken sweatshirt! 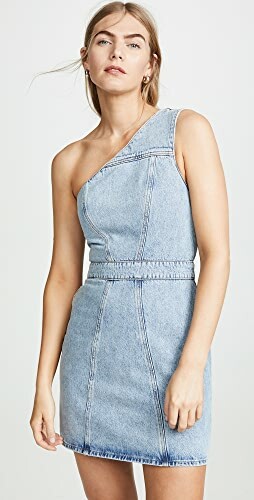 The length is cropped as are the sleeves. The shoulder and wrist also are gathered, creating a little puff sleeve. It also comes in black and white, but I just loved this pretty, vibrant blue! It’s so different from anything else in my closet. Also, it’s super comfortable, as you would expect of a sweatshirt! I wanted to love this tee, but the sheerness was a little too much for me. I think if I sized up it’d be less of an issue. It comes in several other colors. Obviously it’s pretty lightweight! Fit is TTS. 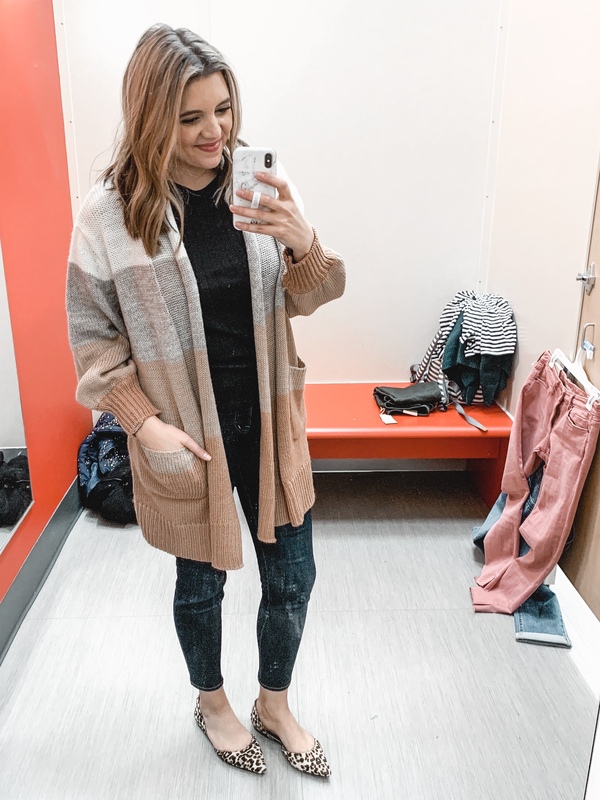 I’ve seen this cardigan on so many different people, I had to try it myself! I really did love the colors in person. 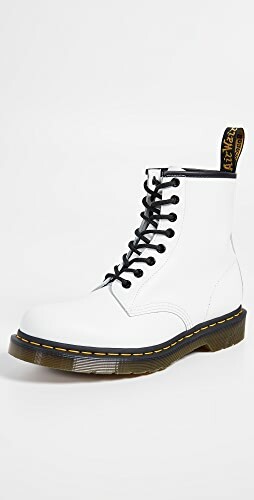 They’re so pretty! But my main complaint is the sizing. I tried a small and this thing was still massive! I probably would have had to size down at least one more to get the look I would have wanted. Alright, y’all. That’s a wrap! 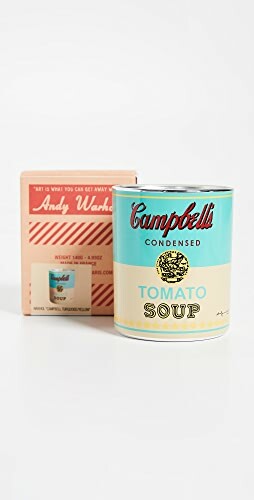 Did you have a favorite item? 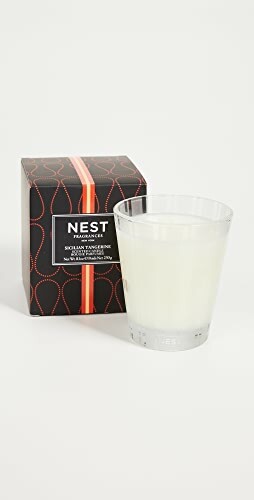 See more Target try-ons here! I love the overalls on you! And all the pink jeans looks. Shop Navy Leggings, Blue Cocktail Dresses, Brown Flats, Black Wedge Shoes and more. Get this widget.